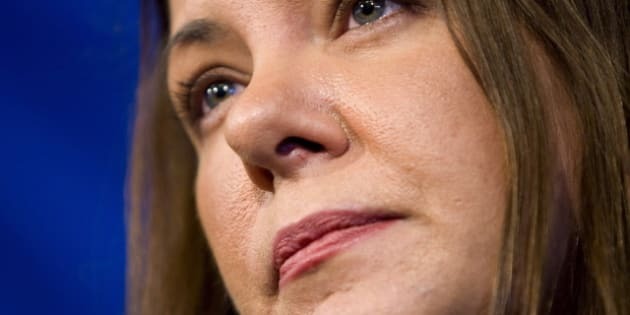 CALGARY - Wildrose Leader Danielle Smith has offered her staunchest defence yet of two candidates whose race-based comments and anti-gay writings have seized the agenda during the last week of a pitched Alberta election campaign. With the mayors of the province's two largest cities calling on Smith to denounce the two hopefuls and the Liberals labelling her party a bunch of "bigots," Smith fired back Friday, saying she refuses to throw anyone "under the bus." "I take it personally when accusations of racism and bigotry are aimed at me and at my party," Smith said at a campaign stop in Calgary. "Let me be perfectly clear — a Wildrose government will not tolerate discrimination against any individual on the basis of ethnicity, religion, beliefs, background, disability or sexual orientation ... period." Alberta is in the grips of one of the most intense election battles in decades as the Wildrose tries to topple 40-plus years of Progressive Conservative government. Voters head to the polls Monday. Polls put Smith's party in front. But a handful of recent surveys suggest the Wildrose's large early lead over Premier Alison Redford's team has slipped somewhat. Feeling the squeeze, the Opposition Liberals have started calling the election a choice between "a bunch of bullies" and "a bunch of bigots." At the centre of this week's controversy are Wildrose candidates Allan Hunsperger, who is running in Edmonton-Southwest, and Ron Leech, who is running for the Wildrose in Calgary-Greenway. Last weekend, a year-old blog post surfaced from Hunsperger, in which he wrote gays and lesbians would end up in an eternal "lake of fire" if they didn't change their sexual orientation. He took aim at "godless" public education and the Edmonton Public School Board's policy of protecting sexual minorities from bullying. Hunsperger took the blog down and said his remarks represented his work as a pastor and not party policy. Smith stuck by him, saying Hunsperger knows those views are not acceptable in the party. Leech apologized this week for suggesting on a Calgary radio show last weekend that he had an "advantage" in the race because he is Caucasian. "When different community leaders such as a Sikh leader or a Muslim leader speaks, they really speak to their own people in many ways. As a Caucasian, I believe that I can speak to all the community," Leech said on CHKF-FM, a multicultural station in Calgary. He clarified Tuesday that he was trying to say he wasn't at a disadvantage being a white man representing a multicultural community. Smith stood by him, too, saying one mistake should not erase 30 years of serving people in his community. But another video surfaced Friday on YouTube in which Leech makes similar remarks about having an advantage because he is Caucasian. "I believe as a Caucasian I have an advantage that for the Punjabi community I am able to speak for the whole community and to lift the whole community up in our region...When a Punjabi leader speaks for the Punjabi, the Punjabi are listening, but when a Caucasian speaks on their behalf, everybody is listening," he told the interviewer, who said he agreed with him. The video does not indicate when Leech did the interview or how widely the interview aired, but there was an election poster with Leech's name in the background. In Edmonton, Premier Alison Redford said she would have removed the two candidates from her team. "The candidates that we want to have elected from our perspective as Progressive Conservatives are people that are talking about the future of the province, moving past issues that were decided 20 years ago," she said. "I was quite surprised to see (Smith's) remarks today. I've been continually surprised this week and perhaps I just shouldn't be anymore." Outrage has festered in some quarters for most of the week. On Wednesday, Calgary Mayor Naheed Nenshi criticized Leech for apologizing for what he said without saying whether he believes it. Edmonton Mayor Stephen Mandel spoke out the same day against Hunsperger, saying homophobia has no place in the capital city. On Friday, a group calling itself Proud of Alberta ran a half-page ad in Edmonton's largest newspaper citing Hunsperger's blog and asking people to "read this and pray for Alberta." The ad backs Redford's stance on human rights. Smith was accompanied at her event Friday by Leech and members of several Calgary ethnic communities. "We believe that what happens in Alberta is when you make a mistake, you acknowledge it, you apologize for it. You move on. You don't just keep using it as a political football," Smith said accusing her critics of "fearmongering." "I know Mr. Hunsperger's a good man. He's been engaged in public service for a long time. His private, personal religious views would not interfere in his role as an MLA." Smith said she firmly believes in the separation of church and state and Hunsperger is entitled to his religious views. "If I feel there's a problem, I will do something about it. If I don't feel that there's a problem, I will defend them and that's what I've done with both Mr. Hunsperger and Dr. Leech," Smith added. "We'll find out on Monday. I think that people actually respect the fact that we're not just going to throw our candidates under the bus at the first sign of controversy."